How Loony Did the Loonie Do in 2013? How did the Canadian dollar fare in 2013? 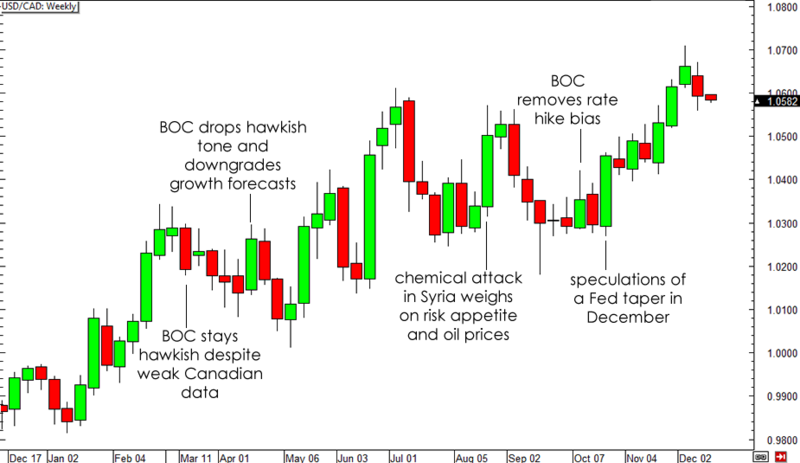 Here’s a chart of price action and a quick rundown of the events that pushed the Loonie around. Most of the Loonie’s price action was dictated by changing monetary policy biases, both in Canada and in the United States. During the first quarter of the year, the Canadian dollar drew a bit of support from the BOC‘s persistently hawkish stance, despite the weaker than expected economic reports released starting January. However, the BOC soon dropped its hawkish rhetoric as Governor Carney left to head the Bank of England and his leadership was taken over by Stephen Poloz. The chemical attack in Syria soon weighed on oil prices, which are positively correlated to the Loonie, and on overall risk appetite. Soon enough, the BOC also let go of its policy tightening bias while the Fed moved closer to tapering bond purchases. This was enough to push USD/CAD up to the 1.0700 handle, chalking up more than 800 pips in gains for the entire year. Do you think this pair will keep climbing in 2014?